It’s not easy being a bike race spectator in the US. In the dark ages we made do with the lousy coverage the major networks carried, and though things got better with OLN (the Outdoor Life Network, otherwise known as the Only Lance Network), now known as Versus, this only helps if you get that channel at home. I do not (I don’t have any channels, for a variety of reasons, one of them being that Comcast was just rated the worst company in America). Normally I don't miss cable TV, except when a big race is on. This post discusses the challenges of watching big races on the Internet, and compares this to seeing local coverage in person. For relatively timely post-race reporting, sites like dailypeloton.com and cyclingnews.com are very decent. We’ve come a long way since the days when “VeloNews” covered major races a month or more after the fact. By early afternoon, thanks to the time zone difference between the U.S. and Europe, you can get a pretty detailed report with great photos. While you’re at it, you can catch up on all the latest bike gossip, such as the bizarre, wacky, possibly insane Floyd Landis confessions. But of course none of this is any substitute for live video footage. If you want to watch the action unfold in real time, you should check out www.cyclingfans.com and www.steephill.tv, both of which have numerous web links to live coverage. Why numerous? Well, most of the video feeds either don’t work or are in another language, or both. There’s no perfect strategy here; you just have to try one link after another. Sometimes there’s no English language option, so you’ll finally have an answer to the question (you thought it was rhetorical), “Why did I study a foreign language for five years? This classic one-day race looked promising so I got up good and early and managed to latch on to a nice English-language feed with ninety minutes left in the race. Announcing were Sean Kelly and some British guy. Kelly, though a huge champion in his day (I’ve always thought of him as the Larry Bird of bike racing) is pretty boring as an announcer. During his racing days Kelly was known for answering questions with a head nod during radio interviews, and his manner hasn’t changed much since then. Nonetheless, his understated style—though absurd for a sportscaster—has kind of grown on me, and it’s funny to hear the other guy try to draw him out. At one point, during an extended lull in the action, the English guy seemed desperate to keep the patter going and really tried to engage Kelly: “So Sean, here’s something nice. Remember that old lady, Coral, who promised to knit us a jumper? Well, she never found the time, but look, she’s mailed us some knit socks! Don't these look smashing?” Kelly replied, “Yes, they’re nice.” The other guy continued, “And they’re even Irish green, isn’t that something?” Kelly said, “Good for winter.” And so on. Suddenly, with about forty-five minutes to go, the English-language feed got blocked. Incongruously, a picture of a bikini babe replaced the video, and a window popped up saying “This feed blocked at the request of the copyright holder” or some such thing. You always run this risk with the Internet video feeds. Why do they tease us like this? In America they wouldn’t suspend the coverage, they’d just hold it hostage for a credit card number. Maybe that’s no better. After the English-language feed vanished I couldn't get anything else to work except Russian (or as the site called it “Slavic”). It was a lot better than nothing, though I barely understood any of it (despite two years of Russian language class). The video part of the feed is still from the British, so I could at least read the occasional phrase that flashed on the screen (Leaders, Chasing Group, etc.). The one spoken word I made out that the announcers used a lot was интересно (pronounced “een-tear-ESS-no”), meaning “interesting.” It was weird: two Russian announcers, a Russian and a Khazak rider well off the front in a major bike race, and yet the two announcers could have been discussing wallpaper samples. No excitement in their voices at all, just two men chatting and saying things like “interesting.” Either they’re just not patriotic, or they aren’t that into cycling, or they’re just very soft-spoken people. Almost seven minutes later, the race leader, Mark Cavendish, rolled by just ahead of another large group. I recognized him immediately, but was puzzled by his standard team jersey instead of the race leader’s jersey. Finally I figured it out: he’s wearing a vest over it. As race spectating goes, this was pretty good, discomfort aside. The trouble is, a tough climb like Trinity Grade barely fazes these guys, and they just go by too fast. If you really want to watch them suffer, you have to find something a lot longer and steeper, or a multi-lap deal like the Nevada City Criterium. Plus, since we couldn’t be in two places at once, we couldn’t watch the finish and thus didn’t learn who won until that night, when we checked out the results online. We saw the blur of racers go by, descended, once again freezing, to a second vantage point for another quick look, then headed back to the coast where we hammered south on Highway 1 a bunch more. Seventy-five miles into the ride, with twenty-five to go to Santa Cruz, we stopped at a convenience store for Cokes and such. When Dan and I came out, our pal Mark had spotted a roadside diner and said, “Conceptually, there’s no reason we couldn’t get a cheeseburger here.” He considered it for a moment, then went on, “Screw it, I’m getting a cheeseburger. You wanna cheeseburger [pointing at me]? You wanna cheeseburger [pointing at Dan]?” Dan and I each twirled an index finger in the air and said, “Three orange whips!” (If you don’t remember or haven’t seen “The Blues Brothers,” don’t bother trying to understand this.) To our great delight, the diner was showing the race on their big TV over the bar, which is how we came this close to getting to see the finish. It was a real nail-biter: Levi Leipheimer, Dave Zabriskie, and Michael Rogers were in a breakaway only about twenty seconds ahead of the charging peloton, with about a mile to go. It seemed like couldn’t get much better than this: burgers, fries, a warm place to sit after a bunch of riding, and race coverage on the telly. But suddenly, the Versus announcer, Phil Liggett, was saying something about us needing to switch to the Versus online coverage. And then—Bam! Literally less than a mile to go, and the coverage stopped. It was 4:00, see, when some stupid pre-game hockey show was scheduled to run, and Versus made no effort to accommodate the late finish of the race. God forbid the hockey fans should miss five minutes of their show so we could see the final result of four and a half hours of bike racing. Nice job, Versus. My chances of ever paying for your channel have just sunk to zero. The trouble with the Tour of California and the Giro d’Italia running concurrently is that it’s hard to stay on top of both. When the American race ended, I was able to better focus on the Italian one. Fortunately, the first truly epic day wasn’t until Stage 7, when the racers tackled the unholy combination of dirt roads and rain: mud wrestling on bikes, basically. I missed this one live, but watched the last fifty or so minutes later in ten-minute installments, thanks to steephill.tv and their handy video archives. The next stage I watched live was the penultimate race, over the mythic Passo di Gavia. This time poor weather temporarily halted the video feed for everybody, worldwide. During this period the footage turned to the spectators atop the high pass, shivering in the cold. (After Trinity Grade, I could begin to relate to their experience.) There was so much snow the road had to be plowed for the racers , so they road alongside six-foot walls of snow on either side. Being terrified of copyright laws, I cannot furnish photos on this blog, but you can see some nice ones here and here and here. Happily, the video eventually returned, and I got to watch the action on the Gavia with the announcing of Sean Kelly and the British bloke. I’m really becoming rather fond of Kelly’s soft-spoken reticence. 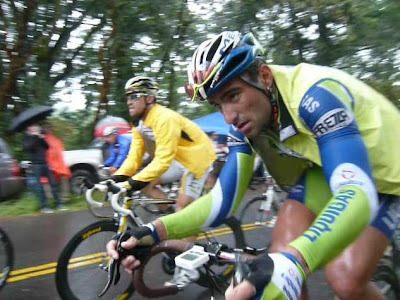 As Ivan Basso, the new race leader, reached the summit, an American announcer would have tried to inject as much drama as possible by saying, “And here he is, the leader of the Tour of Italy, cresting the highest summit of the entire three week race!” or some such. Kelly, after pausing to watch Basso roll by, simply said, “And here’s Basso, all jacketed up.” Something so calm, cozy even, about this simple description. Perhaps my video hosts were feeling a bit punch-drunk on the last day as they announced the time trial event. The Brit watched one rider cross the finish line and said, “Quite a good ride from so-and-so, especially as he’s got no form to speak of.” When Vladimir Karpets, a 6’3” Russian rider, overshot a corner and had to come to a stop, the Brit said, “Not a great spot of bike handling there,” to which Kelly replied, “He’s so far from the ground, he’s probably scared.” As tall rider myself, I winced. But this was nothing compared to their assessment of the Frenchman Thomas Voeckler. “A bit of a loose cannon, isn’t he Sean?”the Brit asked. 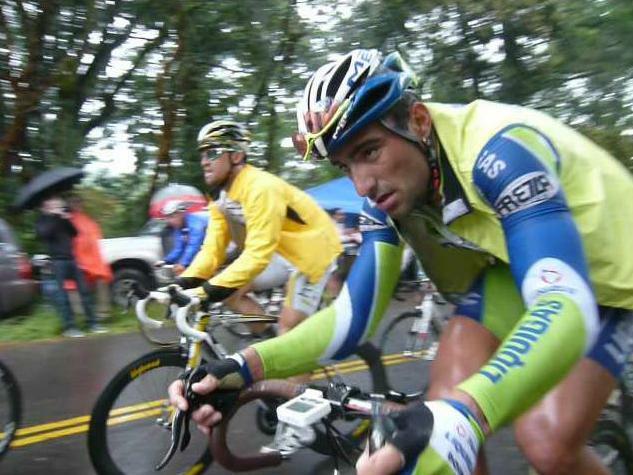 Kelly replied, “Well, he’s impetuous, and he’s the kind of rider who, when he’s in the thick of it, you can’t talk to. Some riders are like that—you can talk to them until they’re in a move, and then they do their own thing. Usually it’s not very bright, but it can work out, if other riders are caught napping, so it’s not always such a bad thing. Besides, other riders you can talk to, who are always aware of everything and don’t make mistakes, well, so often they’re so aware they don’t do anything, and when you tell them it’s time to ride, they’ve always got some problem.” I felt pegged. I've often missed opportunities in races by paying too much attention to my own cautionary impulses. So Dana, I couldn't help but to notice that it seemed to me that your pace, from your video, was at least as fast as that of the racers. All I can conclude is that you could have been a pro! Hey, maybe you still can! I'll tell you what, though, that plate of fries... Man! I want some of that! I'd suffer out in the sleet and cold for a while on a bike for that! And racing on the tee vee to boot! That's living. I have just learned that my lack of televised bike race coverage is more widespread than I thought. No less than Lance Armstrong complained today, via Twitter, "1 week into the TdF and haven't been in a single hotel that had @eurosport so unable to watch race recap. What's up w/ that?"